What does the future look like for the U.S. federal government’s spending, tax collections and national debt? We’ve taken a little deeper look at President Obama’s proposed budget for the federal government for Fiscal Year 2013, which provides the data needed to project the levels for each of these things through the year 2017. To put the President’s plans for federal spending, taxes and the national debt into context, we’ll compare the trajectory for each the the trajectories actually recorded from 2000 through 2008. In doing this exercise, we’ll treat the level of spending and taxes that was recorded for 2009 as being an outlier, which recognizes the unique situation that accompanied the major financial crisis that began in 2008, but which really exploded the U.S. government’s budget for 2009. The straight-line trajectories we’ll show then will be based upon the trends covering the non-crisis years from 2010 through 2017, which we will assume represents the kind of plans for spending and taxes that the President believes should be in effect in the absence of such a major financial crisis. 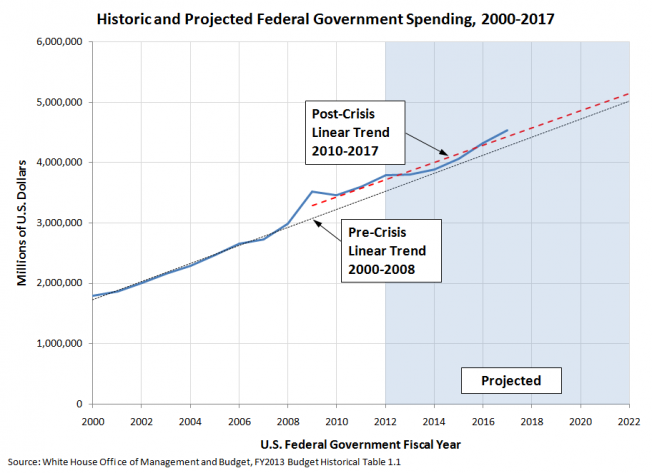 Here, we see the impact of what we’ve previously described as President Obama’s permanent contribution to the federal government’s spending, which we observe follows a parallel, but higher, upward trajectory compared to the trend established from 2000 through 2008. 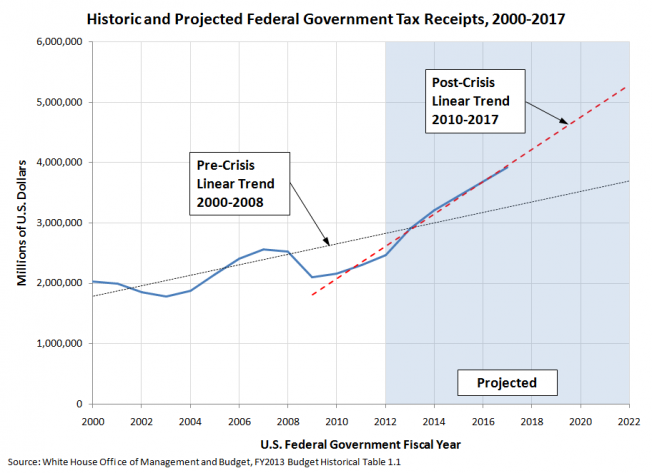 This chart reveals the massive increases in federal tax collections desired by President Obama in his Fiscal Year 2013 budget proposal, which diverge sharply upward from the trajectory established in the years from 2000 through 2008. 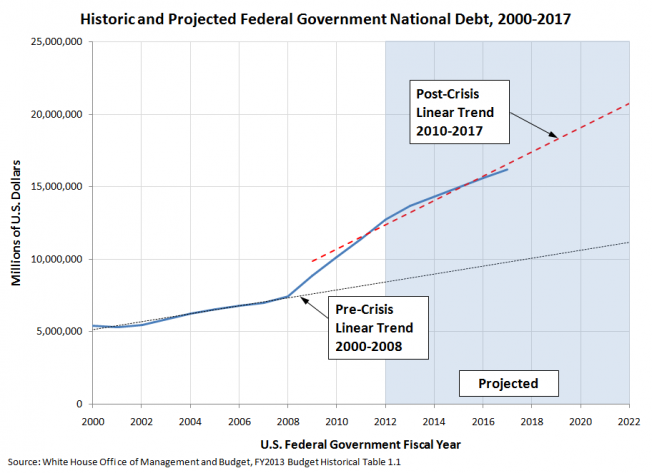 What we find is that the trajectory of the national debt under President Obama’s previous and proposed budgets diverges sharply upward from the trajectory established in the years from 2000 through 2008. This chart demonstrates that the President’s plan to boost the federal government’s tax collections will fail to make any meaningful change to the upward trajectory of the U.S. national debt. All three charts share one characteristic: the trajectories of future spending, tax collections and the national debt proposed by President Obama are the wrong trajectories for the United States, as none are sustainable. White House Office of Management and Budget. Budget of the United States Government, Fiscal Year 2013. Historical Table 1.1. [Excel Spreadsheet]. 13 February 2012.